Algiers (Arabic: الجزائر or Al Jaza'ir, French: Alger) is the capital, chief seaport, and largest city of Algeria, the second largest country on the African continent. The city is the third largest in North Africa behind Egypt's Cairo and Morocco's Casablanca. It is also the political, economic, and cultural center of the country. Located in northern Algeria on the slopes of the Sahel hills, the city extends for 10 miles along the west side of the Bay of Algiers on the Mediterranean Sea. Its strategic location allows the city to serve the Mediterranean region as a major shipping center and an important refueling station. Its location has caused the city to play a central role throughout history. Originally settled by Berbers, the land was eventually controlled by Carthaginians, Vandals, the Byzantine Empire, and by the eight century, Arabs. Spain ruled the city by the early fourteenth century, and in the early sixteenth century, many Moors expelled from Spain sought asylum in Algiers. The city fell under the rule of the Ottoman Empire in 1518. In the early 1500s, Algiers became the main base of the Barbary pirates, who attacked shipping in the western Mediterranean for the next 300 years. The United States fought two wars over Algiers' attacks on shipping—the First and Second Barbary Wars. Algiers played a role in World War II as the headquarters of Allied forces in North Africa and was for a time the location of the Free French government of General Charles de Gaulle. It also played a decisive part during the War of Algeria (1954-1962), in particular during the Battle of Algiers. Up to 1.5 million Algerians died in the bloody independence struggle, which brought Algeria independence on July 5, 1962. While it is listed as the fifth richest city in Africa, it has the highest cost of living of any city in North Africa, and its Casbah neighborhood, built on the ruins of old Icosium, has degenerated, with some of the worst living conditions in North Africa. The Oued El Harrach river, which flows through Algiers, is severely polluted despite the installation of a waste water treatment facility nearby. Mercury levels present are 30 times those accepted around the world. The city name is derived from the Arabic word, al-jazā’ir, which translates as "the islands," referring to several small islands that formerly existed in the bay, all but one of which have been connected to the shore or obliterated by harbor works. Al-jazā’ir is itself a truncated form of the city's older name, jazā’ir banī mazghannā, "the islands of (the tribe) Bani Mazghanna," used by early medieval geographers. Algiers, built along the slope of the Sahel hills, extends for 10 miles (16km) along the Bay of Algiers, and has an area of 105 square miles (273 square kilometers). The coast has a pleasant climate, with winter temperatures from 50°F to 54°F (10°C to 12°C) and summer temperatures from 75°F to 79°F (24°C to 26°C). Rainfall in this region is abundant—15 to 27 inches per year. The Oued El Harrach river, which flows through Algiers, is very polluted despite the installation of a waste water treatment facility nearby. Mercury levels present are 30 times those accepted around the world. As a result of irregular rainfall, and aging, leaking infrastructure, fresh water is a luxury most people enjoy only two to three hours a day. The Hamma project, intended as Africa’s largest seawater desalination plant, has a goal of supplying Algiers with 53 million U.S. gallons (200,000 cubic meters) of potable water a day. The city consists of three sections. The lower part, the French area, characterized by numerous public squares and wide boulevards, was built after the demolition of traditional quarters, starting in 1830, when the French took control. The second area is the Casbah, which is founded on the ruins of old Icosium. Built in the early sixteenth century as an Ottoman fort and a palace for the local ruler, the dey, on the steep hill behind the modern town, the area has a number of mosques, including Ketchaoua (built in 1794), el Djedid (1660), El Kébir (rebuilt in 1794), and Ali Betchnin (1623). Although there are labyrinths of lanes and picturesque houses, the area has degenerated, with some of the worst living conditions in North Africa. The third part consists of the large suburbs surrounding the city, which cover most of the surrounding Metidja plain, and which date to the post-colonial period. The bombardment of Algiers by Lord Exmouth, August 1816, painted by Thomas Luny. 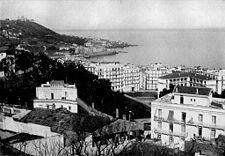 City and harbor of Algiers, circa 1921. Phoenicians founded a commercial outpost called Ikosim, around 1200 B.C.E., on what is now the marine quarter of Algiers. Carthaginians and the Romans called it Icosium. The city became part of the Roman Empire after the Punic Wars in 146 B.C.E. Vandals overran the city in the middle of the fifth century. Next, it was ruled by the Byzantines, who were in turn ousted in 650 by Arabs. In 944, Buluggin ibn Ziri, the founder of the Berber Zirid-Senhaja dynasty, revived the city into a center of commerce under its present name. During the next three centuries the city was controlled by various European, Arabian, and Berber warlords. In the thirteenth century, Algiers came under the dominion of the Abd-el-Wadid sultans of Tlemcen. The city retained a large measure of independence under amirs of its own, Oran being the chief seaport of the Abd-el-Wahid. The islet in front of the harbor, subsequently known as the Penon, had been occupied by the Spaniards as early as 1302. Thereafter, a considerable trade grew up between Algiers and Spain. In the early sixteenth century, many Moors expelled from Spain sought asylum in Algiers. In response to attacks from Algiers on Spanish seaborne commerce, Spain, in 1510, fortified the offshore island of Peñon in the Bay of Algiers. 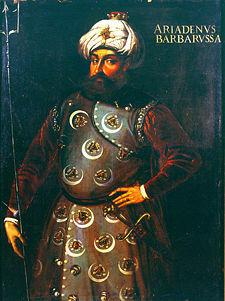 In 1516, the amir of Algiers, Selim b. Teumi, invited the corsair brothers Aruj and Khair ad-Din Barbarossa to expel the Spaniards. Aruj came to Algiers, caused Selim to be assassinated, and seized the town. When Aruj was killed in battle against the Spaniards at Tlemcen in 1518, Khair ad-Din succeeded him, and placed Algiers under the Ottoman Empire. Algiers from this time became the main base of the Barbary pirates who attacked shipping in the western Mediterranean and engaged in slave raids as far north as Cornwall, in England. European powers sent numerous expeditions against the pirates. In October 1541, the king of Spain and Holy Roman Emperor Charles V sought to capture the city, but a storm destroyed a great number of his ships, and his army was defeated. The United States fought two wars over Algiers' attacks on shipping—the First and Second Barbary Wars. 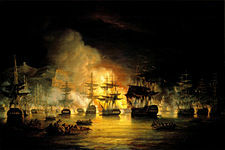 In 1816, a British squadron under Lord Exmouth (a descendant of Thomas Pellew, taken in an Algerian slave raid in 1715), assisted by Dutch men-of-war, bombarded the city. On July 4, 1827, on the pretext of an affront to the French consul (whom the dey had hit with a fly-whisk in a dispute over French debts to two Algerian Jewish merchants) a French army under General de Bourmont attacked the city, which capitulated the following day. On June 14, 1830, the French made Algiers a center to control their colonial empire in North and West Africa. French control lasted 132 years. During World War II, Algiers became the headquarters of Allied forces in North Africa and was, for a time, the location of the Free French government of de Gaulle. Algiers also played a decisive part during the War of Algeria (1954-1962), in particular during the Battle of Algiers. Up to 1.5 million Algerians died in the bloody independence struggle. Algeria became independent on July 5, 1962. In October 1988, one year before the fall of the Berlin Wall, Algiers was the theater of demonstrations to end the single party system. Harsh repression left more than 300 dead. Algiers has been the target of Islamic terrorist attacks. On April 11, 2007, the palace of the Prime Minister and the Minister of Interior Department, as well as a police station were bombed. Islamic terrorist group Al-Qaïda claimed responsibility. On December 11 of that year, twin blasts struck United Nations offices and a Government building in Algiers, causing dozens of deaths. 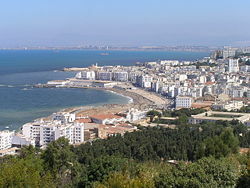 Algiers serves as the capital city of the nation of the People's Democratic Republic of Algeria, as well as of the Province of Algiers within that nation, which consists of 48 provinces. 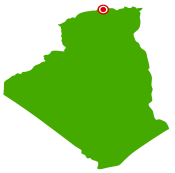 The Province of Algiers is divided into 13 districts and 57 municipalities. The districts are, according to official numbering: Zéralda 1, Chéraga 2, Draria 3, Birtouta 4, Bir Mourad Raïs 5, Bouzaréah 6, Bab El Oued 7, Hussein Dey 8, Sidi M'Hamed 9, El Harrach 10, Baraki 11, Dar El Beïda 12, and Rouïba 13. Algiers' strategic location and harbor make it a major shipping center and an important Mediterranean refueling station. Principal activities include the import of raw materials, industrial goods, and general supplies, as well as an administrative and financial center. Grain, iron ore, phosphates, wines, early citrus fruits and vegetables, and oil from central Algeria are the main exports. Algiers is listed as the fifth richest city in Africa, with a GDP of US$35 billion in 2005. Its stock exchange had a capitalization of 60 billion euros. 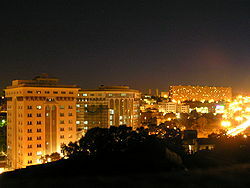 The city had the highest cost of living of any city in North Africa, as well as the 50th highest worldwide, as of March 2007. The Kasbah (Qasbah), designated a World Heritage Site in 1992, along with the claim that Algiers is the crossroads of three worlds—Mediterranean, Islamic, and African—as well as numerous sandy beaches, has helped make Algiers a popular tourist destination. 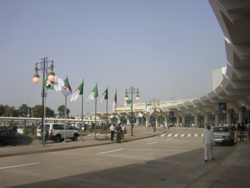 Algiers has a major international airport, the Houari Boumedienne Airport, and is the hub of a network of railways and roads. The port of Algiers is sheltered from all winds. There are two harbors, both artificial—the old, or northern, harbor and the southern or Agha harbor. Entrance to the terminal of Houari Boumedienne Airport. The metropolitan population of Algiers was 3,518,083 in 2005, the 85th largest in the world, according to Demographia. The ethnic distribution is 59 percent Arab, 38 percent kabyle, and three percent "foreigners," most of whom are from China, Vietnam, and Mali. The official languages are Arabic and Berber (Tamazight), but French is still used for most official and business transactions, while English is rarely spoken outside of business or tourist centers. About 99 percent of the population are Sunni Muslim, which is the state religion, while the remaining one percent are Christian and Jewish. The Bardo Museum holds some of the ancient sculptures and mosaics discovered in Algeria, together with medals and Algerian money. There are numerous old buildings of interest in Algiers, including the whole Kasbah quarter, Martyrs Square (Sahat ech-Chouhada ساحة الشهداء), the government offices (formerly the British consulate), the "Grand," "New," and Ketchaoua Mosques, the Roman Catholic cathedral of Notre Dame d'Afrique, the Bardo Museum (a former Turkish mansion), the old Bibliotheque Nationale d'Alger—a Turkish palace built in 1799–1800—and the new National Library, built in a style reminiscent of the British Library. The main building in the Kasbah was begun in 1516, on the site of an older building, and served as the palace of the deys until the French conquest. The Grand Mosque (Jamaa-el-Kebir الجامع الكبير) is traditionally said to be the oldest mosque in Algiers. The pulpit (minbar منبر) bears an inscription showing that the building existed in 1018. The minaret was built by Abu Tachfin, sultan of Tlemcen, in 1324. The interior of the mosque is square and is divided into aisles by columns joined by Moorish arches. 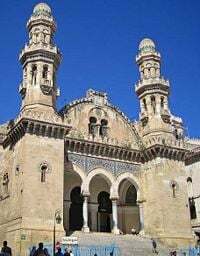 The New Mosque (Jamaa-el-Jedid الجامع الجديد), dating from the seventeenth century, is in the form of a Greek cross, surmounted by a large white cupola, with four small cupolas at the corners. The Church of the Holy Trinity (built in 1870) stands at the southern end of the rue d'Isly near the site of the demolished Fort Bab Azoun باب عزون. The interior is richly decorated with variously colored marble. Many contain memorial inscriptions relating to the English residents (voluntary and involuntary) of Algiers from the time of John Tipton, British consul in 1580. The Ketchaoua mosque, at the foot of the Casbah, was before independence in 1962, the Cathedral of St Philippe, itself made, in 1845, from a mosque dating from 1612. The principal entrance, reached by a flight of 23 steps, is ornamented with a portico supported by four black-veined marble columns. The roof of the nave is of Moorish plaster work. In one of the chapels was a tomb containing the bones of San Geronimo. The building seems a curious blend of Moorish and Byzantine styles. Notre-Dame d'Afrique, a church built (1858–1872) in a mixture of the Roman and Byzantine styles, is conspicuously situated, overlooking the sea, on the shoulder of the Bouzareah hills, two miles (3.2 km) to the north of the city. Above the altar is a statue of Virgin depicted as a black woman. The church also contains a solid silver statue of the archangel Michael, belonging to the confraternity of Neapolitan fishermen. ↑ Population of the city proper accoding to the 1998 census via. Citypopulation.de. Retrieved June 27, 2010. ↑ UN World Urbanization Prospects. Esa.un.org. Retrieved June 27, 2010. Algiers. 2007. Gardners Books. ISBN 9780548293539. Baepler, Paul Michel. 1999. White Slaves, African Masters: An Anthology of American Barbary Captivity Narratives. Chicago: University of Chicago Press. ISBN 9780226034041. CIA World Fact Book. Algeria. Retrieved June 23, 2008. Demographia. Demographia World Urban Area Projections 2007 and 2020. Retrieved June 23, 2008. Encyclopaedia Britannica Online. 2008. Algiers. Retrieved June 23, 2008. Kagda, Falaq, and Zawiah Abdul Latif. 2007. Algeria. New York: Marshall Cavendish Benchmark. ISBN 0761420851. Looklex Encyclopaedia. Algiers. Retrieved June 23, 2008. Morgan, Joseph. 1728. History of Algiers. Pontecorvo, Gillo, Franco Solinas, Brahim Haggiag, Jean Martin, Yacef Saadi, Samia Kerbash, Ugo Paletti, M. Gatti, and Ennio Morricone. 2004. La bataille d'Alger The Battle of Algiers. Irvington, NY: Criterion Collection. ISBN 9780780028876. The Monument of the Martyrs (Maquam E’chahid). The El Jedid mosque at the Place des Martyrs. Inscription in the dome of Our Lady of Africa Basilica, which says "Brotherly love comes from God. It is God himself." This page was last modified on 4 March 2019, at 23:56.